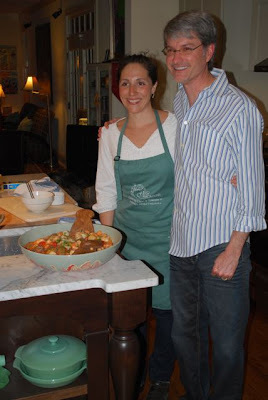 I had a really fun time cooking with my new friends, Ross and Jimmy, in their beautiful kitchen. It was a cooking class (with me) for a few of their friends --a gift for Jimmy's birthday. Having grown up in Florida, Jimmy loves seafood and wanted to make that the basis of the dinner. Having grown up in Colorado, I am not a seasoned seafood cook, but I have spent a lot of time in Italy where seafood is plentiful. I find that the best recipes, which happen to be mostly Italian in my world, are the ones that are the simplest to prepare and highlight the quality of the minimal ingredients. With this is mind, I chose to do a first course of spaghetti 'allo scoglio'. A seafood pasta eaten all over Southern Italy, it is named after the rocks that jut out from the sea, containing lots of tasty creatures clinging to their surface--clams, mussels, shrimp and squid... I could not get mussels that day, so I settled for shrimp, littleneck clams and bay scallops. The sauce is a simple red sauce. Start with onions and garlic and sautée in olive oil, then add 1/2 cup white wine and let it reduce a few minutes. 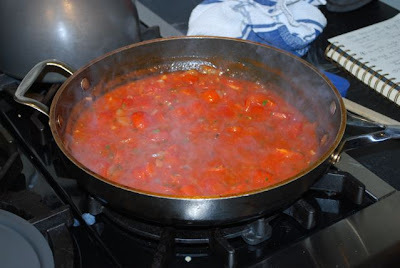 Then add tomatoes -- fresh or canned - or a combination of both, plus 1/2 cup of clam broth (I purchase this and it comes in a bottle found in most grocery stores). Let the sauce cook for a bit over moderate heat. 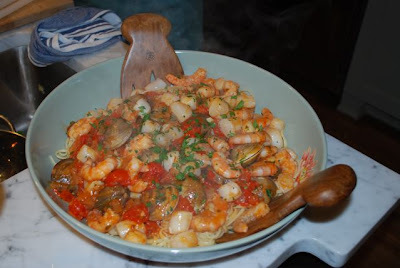 A key ingredient in this sauce which I think is key for any seafood pasta is the heat that a hot oil brings, either added directly into the sauce, or afterwards when serving --or both, which is what we did. To make it, simply mix 1/2 cup of olive oil with 1/4 cup of chopped parsley, 2 teaspoons of crushed red pepper and 2 tsp of sea salt. 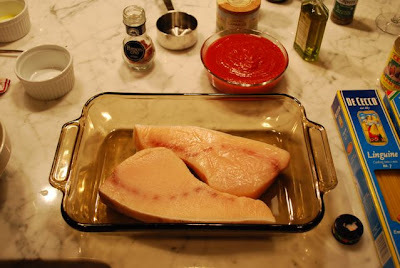 For our second course, I had picked up some beautiful swordfish steaks at the market and knew that would be a treat. We made a lemon-oregano-olive oil marinade for the fish that gave it just the delicate flavors it needed. This light, lemony sauce for fish comes from Sicily where lemons are a prized fruit and sometimes reach the size of small footballs. They are gorgeous! But lemons in our market now, while not the Sicilian variety, are still big and fragrant. It's the perfect time to use them. We let the fish sit in the marinade for an hour before broiling it alongside some simple yellow potatoes, roasted in olive oil, sea salt and rosemary. That's it! As you can see, these classes are not about learning fancy techniques or secrets --just simple, everyday dishes that most people can prepare using high-quality, seasonal ingredients. For dessert: a cake. Again, a simple cake, but one that tastes and sounds like it took a lot more work: Almond cake with pears and creme anglaise, from a F&W recipe I found around the holidays. It's like a spongecake, light and airy, only made with almond flour which gives it something special. Substitute pears for anything at other times of the year--raspberries, apricots, apples or lemon custard--and it's your go-to cake! What a fun night! 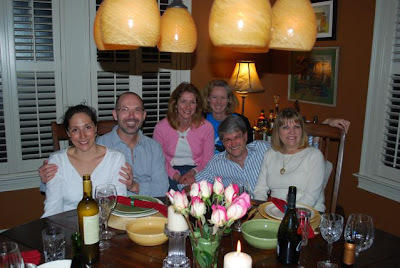 I loved this class--good people, good food and great conversation. Being in the kitchen together with friends is what it's all about. Thanks to all of my new friends: Ross, Jimmy, Katie, Susan and Beverly. I hope to see you in the kitchen again soon! ps: A thank you to Jimmy for the photos! I wanted to post the second part of my venison adventure so that you would see that it wasn't just a blip on the radar. 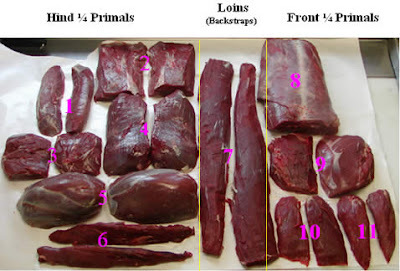 I have talked to many people who say that venison tastes "gamey" or strange, or that they just were not impressed. I, for one, did not have that experience as you saw from the first venison post, and this dish confirms that. One more for the buck. Or for us, as the case may be. I decided with the tenderloin to make the most of its deep, natural flavors and serve it with a risotto that was just as rich. This complementary richness of flavor would be the crowning glory of my dish. I love the way the meat looks raw and crimson-colored, but before you accuse me of being "blood-thirsty" and "gross," just let me say that there is nothing wrong with liking the look of good, ultra-fresh animal meat. On the contrary, it is a stance that many people can relate to when it comes to the fresh, glistening look of sushi-grade fish. That's a dead animal too, lest we forget. But the meat here tastes as great as it looks and the appearance of meat in its raw form is just as important as the cooked form. If it doesn't look good, don't buy it --rule number one for me. And, if you have a healthy respect for the food you prepare, you should be able to admire its natural beauty. So, I have a clean conscience. It's clean also because I know that this deer was killed by someone I know and it was given to us as a gesture of sharing. That sharing between the animal and its predator and between the hunter and us is what the natural world is all about. I surprise even myself here. Anyway, I had some risotto as well as some dried porcini mushrooms in the cupboard so I soaked the mushrooms in about 1/3 cup of warm water while the meat was marinated with olive oil, salt, pepper and fresh thyme from my still productive herb garden. This soaking/marinading lasted about 30 minutes. (* Don't throw out the mushroom water! it will come in handy for the sauce). The combination of fresh thyme, mushrooms and a sauce based on dijon mustard was just the thing to bring out the flavor of the venison. It was pretty easy to do as well. I made the risotto as usual, with white wine and broth, parmesan cheese and butter, stirring for about 20 minutes. When it was ready, I quickly seared the meat in olive oil (some of the pieces were cut too small but the larger ones were cooked perfectly. As I said before, cooking venison is tricky and it can be ruined easily! Lesson learned: cut pieces that are uniform in size and not too small that they'll cook too fast). I quickly deglazed the crispy meat bits left in the skillet with white wine and a mixture of the mushroom water and about 2 tsp. of good dijon mustard. I let that liquid cook down for a minute until it was thick and poured it over the meat which rested on top of the risotto. We enjoyed this delicious venison dish with a gorgeous Cotes du Rhone Domain Catherine le Goeuil hand-selected for us by our friend Will at Woodland Wine Merchant. It was a little bit of a splurge for a weeknight, but the venison merited such a treat. And what a marriage made in Heaven it was. Thank you again, my deer. We loved you. I had my first experience cooking freshly killed meat and it was surprisingly satisfying. A co-worker of the b.f.'s is an avid hunter and fisherman and he recently gave us a cooler full of fresh meat and fish. This is one good thing about living in Tennessee. I know I like to mutter bad things under my breath every time I see those big guys dressed head-to-toe in camo with their bright orange accessories, especially when they wear it to the grocery store or to a football game (I kid you not). I have learned by now that it's just part of living in the South. Like living in Colorado and seeing people in spandex bike shorts eating at the table next to you. It's just a different type of "outdoor look." I prefer the spandex myself. But I was not going to turn down a cooler full of venison and catfish just because of some little scruple I have about killing animals for sport. Yes, I am against it personally, but I know there are a lot of people out there doing it and if they're going to do it anyway, we might as well pay tribute to the slain animals by preparing and eating them with respect. Plus, I had never tasted fresh venison and was eager to try it. It was in this frame of mind that I did some research on cooking venison. I had read that it was very easy to ruin it. Since there is very little fat, it is easy to over-cook it, turning it into something tough and chewy. I chose the small steaks for my maiden voyage into freshly killed deer preparation. By the way, this animal came from near Carthage, Tenn., not far from Nashville, and it happens to be where Al Gore's people come from. This deer was killed only about a week prior to arriving on my doorstep, frozen for just a short time. It was a deep crimson and there was a lot of blood that seeped out even while it was cooking. All I could think of was how fresh and natural it looked --nothing like the blandly colored meat from the grocery store or even the organic kind that sometimes seems dry. It was oozing freshness and I couldn't wait to taste it. I discovered a little bit of blood-lust I never knew I had! As this was a tender cut of meat from the loin or leg, I decided that high heat for a short time was the best way to go. They were very thinly cut, so no pounding was necessary. I didn't want to douse it in sauce, but I needed some accompanying flavors, so I did a quick preparation of "carne alla pizzaiola" which is really just diced tomatoes, garlic, oregano and I added some capers. I heated the oil in a skillet, addeed some whole garlic cloves to flavor the oil, removed them and when the oil was very hot, I quickly browned the meat for 2 to 3 minutes per side. I seasoned the steaks with salt and pepper, removed them to a platter and kept them warm while I prepared the sauce: add and simmer briskly one can of chopped tomatoes, 1 to 2 T fresh oregano leaves (or dried is fine too), a pinch of red pepper flakes. Stir in 2 T capers, 1/2 cup of white wine, season with salt and pepper to taste. Serve immediately over the steaks. The taste of venison was even better than I imagined. It was pure, natural meat that tasted the way meat is supposed to taste. That's the only way to describe it. Thank you, deer. I served it with a side dish of quick pan-roasted brussels sprouts, which we love with just about anything. I don't know how many times I'll get the chance to prepare fresh venison like this again (I have a tenderloin in the freezer still and a half-strap, whatever that means). But I could get used to this. Too bad my man will never pick up a gun, which is just fine with me. Thou shalt not kill. But if you bring to my doorstep, I will cook it. And it will be GOOD. Now here's something that makes me happy. It's a chocolate-raspberry ganache cake that I made recently for my boyfriend's mom's birthday. Composed of two layers of moist chocolate cake (the secret ingredient being sour cream), with a layer of raspberry jam and ganache in the middle, smeared with more ganache and dotted with fresh raspberries, it was a heart-warming thing to make. I'm not talking about how it made me or anyone feel when eating it (that was good too). No, I'm talking about what it does for me to bake a cake. Nourishing the soul and calming the nerves. These are the direct results of baking for me. Or cooking. Or anything that involves me in my kitchen alone or with my best guy and our sweet dog who likes to assist from her perch on the floor in front of the sink. In this, the middle of winter (6 weeks to go until Spring! ), when we've had very cold weather for weeks and weeks, and the days are short and often dark, it's baking and cooking that lift my spirits, not to mention filling our bellies. Take this weeknight mac n' cheese, for example. It took nothing to prepare. Just cook some macaroni. Toast some bread crumbs. Melt some butter, cheese and milk. Add a little nutmeg and salt and pepper and combine with pasta. Throw in some wilted kale for green, fill a baking dish with this goodness, sprinkle the top with the toasted bread crumbs, more cheese and bake for about 20 minutes. Oh, it's yummy and warm and sure, it'll cost you some calories. But whatever. It's the middle of winter, like I said. Here's something else that warms my soul: a simple roasted chicken over roasted root veggies for an easy and delightful mid-winter meal. And, for something to pick me up in the afternoon when all I want is to curl up with a good book next to the fire but work keeps me at my desk: a shot of espresso with a homemade biscotti. It's all good. It's winter. And it'll soon be Spring. So stop complaining and get in the kitchen (I tell myself) and don't forget to breathe. PS: Happy one-year anniversary to me and to the Joy of Cooking! 2) this song: "the times they are a'changin" (bob dylan, covered by mason jennings on "I'm not there" soundtrack).